So yesterday, Internal and I were talking about making the forum into an ultimate X/X-2 symposium/fan hangout since the sad reveal that there probably won't be an X-3. The first idea that came to our minds was to make a gallery where we can showcase our original dressphere concepts, designs, and dressphere icons. Much like all those scrapped ideas from the International + Last Mission dressphere contest. We can also make alternate designs to the existing dresspheres in the game, such as making a different outfit or making a version for men. They can be male, female, or both. And so, here we are. Also, if you would like to see a visual version of your idea for a dressphere, but are inconfident in your ability to draw, you can make a request to have another person on the forum, like Internal or me, draw it for you. To do so, put [REQUEST] in your post along with the name and brief description of your dressphere. If they accept, don't expect them to do it right away. Art takes time, after all. If they decline, don't complain. Wait until somebody else takes up the challenge. If you want to get really creative, you can also, along with your design, provide it with attacks, abilities, and even new moves exclusive to the dressphere. To start off, I'll provide you all with three dressphere ideas of my own. Fiend Slayer - The soul of a master slayer; feared yet despised by fiends everywhere. Design is based on multiple skins and carcasses of fiends that you find throughout the game. Weapon is based on a Sinspawn from FFX. Because of the veteran status, killing fiends is much easier to do in this dressphere; dealing double damage and increasing the chance of getting a critical hit. However, it comes with an Auto-Provoke status, targeting a random fiend and making that fiend only attack the user. The attack bonus also doesn't apply to machina and human enemies. Reversal - The soul of a person overcome with darkness, yet not a fiend. Design is based on a corrupt half-human, half-fiend hybrid with alien instincts and movements. Think of Sora's Anti Form from Kingdom Hearts 2. In this dressphere, the user is granted with greatly increased stats and stronger spells. However, you can't control which enemy it targets. The user can even attack its allies. Item usage and accessory bonuses do not apply in this dressphere. Attacking the user with an ally heals it, and using healing items on the user with an ally deals damage to it. Once changed into Reversal, the user can't change out of it for the rest of the battle. Reversal can't be equipped as a default dressphere. Cyberstriker - Malicious circuits from the time of ancient Zanarkand. Design is based on a futuristic/robotic armour: think of Tron. The dressphere is meant to represent a computer virus/trojan, making its Speed and Strength/Magic stats incredibly high, and has a robotic parasitic partner. It deals double damage to machina enemies. Cyberstriker will start off lacking in the Defence/Magic Defence stats, but the more enemies are defeated with Cyberstriker, the higher they will get. Most attacks deal minimum damage, but have multiple strikes. I might provide drawings of these in the future, (using Tidus, of course. Muahahah) but for now, I'll leave you all to it and I'll try thinking of more ideas. As a small start, I'll post the dressphere sprites CoL made a while back here in this thread so they're more properly allocated. If things kick up, we can have competitions and what not. Don't be afraid to throw an idea out there, even if it isn't well-developed; that's what community collaboration is for, after all. Now, I kinda have a thing for cartoonish chef designs; I find them adorable and creative. I think this would have been the Alchemist dressphere if they didn't use that. I digress, though. Because I felt like it, I made a Chef dressphere design for males, or in this case Tidus. 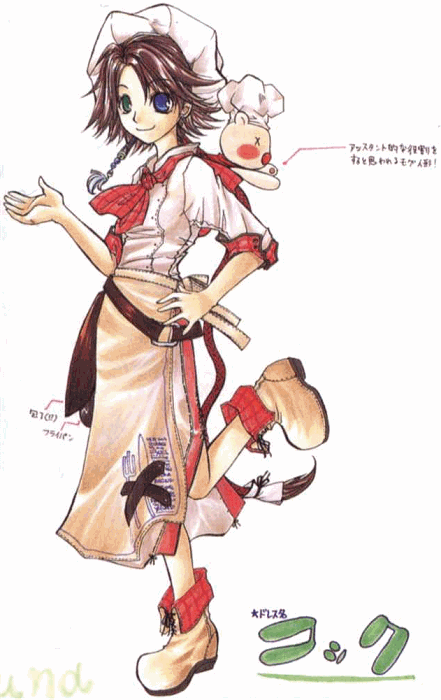 It's supposed to resemble a sort of oriental-styled chef outfit mixed with an ordinary European/American one. The big barrel on the back is supposed to be a rice barrel, and that pot on his leg is supposed to be a spice jar.